The WM7400/WM7600 Series weighmeters provide fast, easy counting and weighing. Their 304 SS enclosure is designed for washdown applications and has an adjustable U-bracket for bench or wall mounting. On the sealed keypad, the user can perform complex functions with the push of a button. 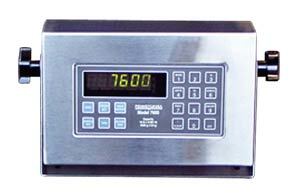 The WM7600 has time/date battery backup and audit trail accountability. Both models feature bidirectional RS232, RS485, RS422, and current loop communications. 참고: Comes with complete operators manual.